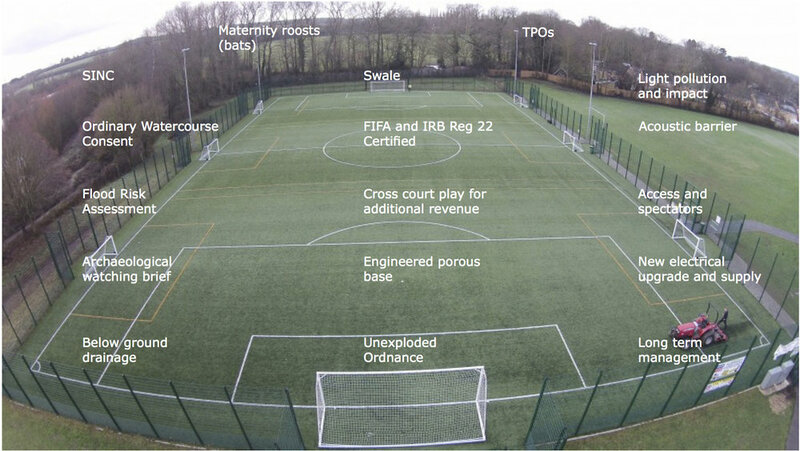 Completed in 2013 the 3G sports pitch at Connuaght Secondary School was co-funded between Rushmoor Borough Council and Hampshire County County. The site lay within EA Flood Zones 2 and 3, adjacent to a river and a SINC. Furthermore, an archaeological desktop study revealed the potential for Saxon remains, so a watching brief was required at the start of the construction phase. The project was built by Kestrel during the wettest winter on record, but was not delayed due to the requirements specified within the tender documents for ground protection, method of working and detail design of the pitch. The design solution for this flat site was to provide a camber running across the centre of the pitch to discharge water away from the playing surface to the outside, before being discharged to a swale. Other design constraints and challenges are illustrated on the photograph. Photograph courtesy of Kestrel.